Adrian Tuohy was shown a yellow card after the incident with Limerick’s Barry Murphy. RTÉ PUNDIT MICHAEL Duignan has branded as ‘absolutely despicable’ the challenge by Galway defender Adrian Tuohy on Limerick forward Barry Murphy in yesterday’s Division 1B league showdown in Pearse Stadium. Limerick claimed a two-point victory to secure promotion to the top tier next spring but Duignan felt the reigning All-Ireland champions were fortunate to see their defender escape with a yellow card after the incident in Salthill. “To me it’s absolutely despicable,” Duignan told RTÉ’s Allianz League Sunday last night. “A belt into the testicles like that. 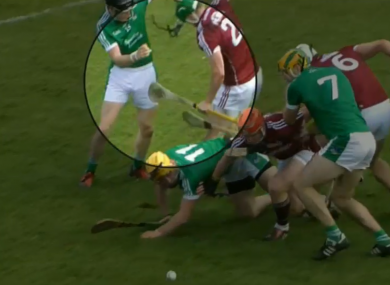 Hurling people don’t do that, you might give a lad a dig into the stomach or a belt. “And amazingly, Cathal McAllister goes over to the All-Ireland referee Fergal Horgan on the line, asks him did he see it. “He obviously saw something, because he gave him the card. How can he give a yellow card? What sort of an example are we showing? “We all played the game hard and there would be belts given, but that sort of an incident – and I had a bad injury myself in that area, and my young lad had last year as well – it’s not nice. It’s life-changing. “Barry Murphy was lucky, he wasn’t badly hurt. He got up and played a very good second-half. With a major prize on offer as both sides sought the coveted promotion spot, ex-Clare and Dublin boss Anthony Daly felt there ‘was a real edge to the game’. “We had Diarmuid Kirwan and we had Fergal Horgan on the lines there today. There was an incident before half-time as well, wasn’t maybe clearly caught,” he said. “There were a lot of helmets pulled, there was meant to be a bit of belting. We’re not so sure. “Very lucky there wasn’t red cards shown there today. You can watch the analysis on League Sunday here on the RTÉ Player. Email “'To me it's absolutely despicable' - Duignan on challenge by Galway defender in Salthill”. Feedback on “'To me it's absolutely despicable' - Duignan on challenge by Galway defender in Salthill”.